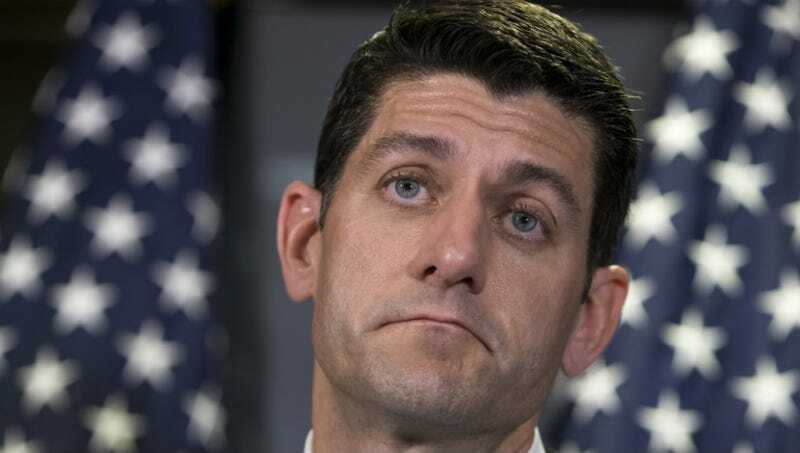 After weeks of hemming, hawing and scanning the room for the closest exits, House Speaker Paul Ryan has announced that he will vote for Donald Trump, an oversized wasp exoskeleton stuffed with old mustard. What a proud and exciting moment for us all. This announcement, which you can also locate in the dictionary under the entry for “tepid,” comes after weeks of Trump’s camp trying to bring Ryan close as he desperately squirms from their embrace. “Senior campaign sources” within Team Trump—I wonder who that could be—wrongly told ABC that Ryan would endorse Trump over a week ago. “I have no timeline in mind,” Ryan said in response. And now—well— has Paul Ryan endorsed Donald Trump? Or has he merely announced that he’s going to vote for him, in the same way that I “announced” this morning that I would be eating dry cereal, because someone finished my almond milk? Fun questions to consider as we move forward into this next phase of our shared national nightmare!